GLASdek evaporative media is made from a flame retardant material fortified with special rigidifying agents. The cross fluted, unequal angle pad design induced highly turbulent mixing of air and water for optimum heat and moisture transfer. This unique design also functions to continually direct more water to the air entering face of the pad, where the more intense evaporation occurs, further enhancing the operating efficiency of the pad. Exceptional cooling rates are achieved due to the design, manufacturing and materials used in GLASdek. The shallower angle of Munters® unequal flute design allows high velocity air to travel through the pad without water droplet carryover. 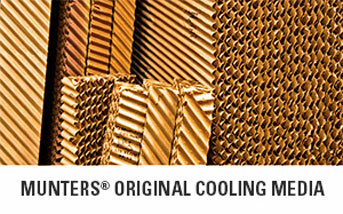 Munters® GLASdek resists the clogging caused by dust or sand. The water flushes dirt and debris from the surface of the pad. The water is directed toward the air entering face of the pad by design, where it is needed most. Water flow needed is based on the depth of the media used. GLASdek requires 1.5 gallons per minute of water per square foot of horizontal (top) pad surface area. For installations that have intense evaporation or pad walls taller than 72″, an additional 10-20% of water may be required. The gutter and sump should be sized to supply the system with enough water to operate at its maximum flow rate and not overflow when the system is shut down. TUFedg® algae-resistant edge coating is available for all sizes of GLASdek evaporative media for longer pad life and easier cleaning. 2″ or 3″ distribution pads disperse water laterally and evenly across the top of the pad. These specially designed pads are also protected with Munters’ patented edge treatment. Mineral deposits can be minimized by maintaining a continuous water bleed-off, or by periodically dumping the sump. The exact amount will depend on the pH and hardness of the supply water, and Munters® can assist you by recommending individual bleed-off rates. Note: Fractional timers should not be used. These timers do not enhance the performance of a cooling pad and actually contribute to the development of scale. If algae is allowed to grow freely on GLASdek it may eventually clog the passages and inhibit the flow of air. This increases the static pressure and reduces the efficiency of the pad. Algae build up can be controlled by early implementation of simple maintenance techniques. Munters® maintenance bulletins provide information to help maximize the efficiency and life of GLASdek.